-3 DENTISTS with over 53 YEARS of combined clinical experience. Open MONDAY thru FRIDAY to better serve our patients. 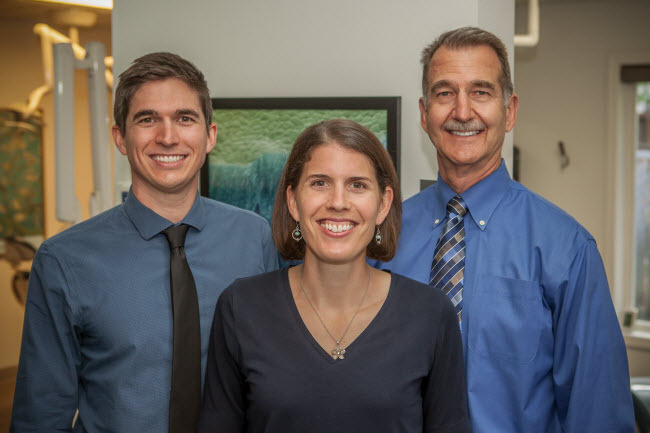 Dr. Joe Jenson, Dr. Susie Watkins & Dr. Tyler Peterschmidt offer patients a comprehensive list of general & restorative dental services designed to meet the needs of the entire family. Our goal is to assist each of our patients and their families in achieving their goals and maintaining long term dental health. If you are an existing patient we would like to thank you for trusting us with your dental care. If you are a new patient we would like to welcome you to our dental office. DR TYLER PETERSCHMIDT, DR SUSIE WATKINS, DR JOE JENSON. You See What We See. An intra-oral camera is used during consultations, which allows us to easily capture and display images of your mouth and teeth so You See What We See. Find out how great it is to make informed decisions when it comes to your oral health. Please browse through our website and be sure to give us a call @ (541) 342-3398 if you have any questions or would like to schedule an appointment. You may also use our online appointment request form to schedule your appointment. Eugene Dentists, Joe Jenson, DMD, Susan Watkins, & Dr. Tyler Peterschmidt, offer patients a comprehensive list of general, restorative and cosmetic services that include: Teeth Whitening, Root Canal Therapy, Periodontal Treatments, Crowns, Veneers, Dental Fillings, Emergency Dentistry and Dentures& Partial Dentures. Accepting dental insurance and offering dental financing.